Part of the brilliance of the Marv Wolfman/George Perez run on Teen Titans was that the team lent itself to telling all sorts of stories. Robin and Kid Flash offered a way in to traditional superheroics, but equally Starfire opened the door to space epics; Raven, to the supernatural; and Wonder Girl, to a variety of Mount Olympus epics. Part of what kept the series fresh is that the characters allowed it to be about anything. That's a formula fairly well used by now, but I'm reminded of it in reading Red Hood and the Outlaws Vol. 5: The Big Picture. After the previous volume by James Tynion, Vol. 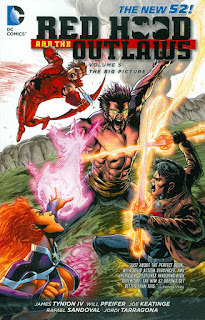 5 sees the book in transition back to original writer Scott Lobdell in Vol. 6, with stories in Vol. 5 by Tynion, Will Pfeifer, and Joe Keatinge. These vary indeed from a mystic battle with Ra's al Ghul to a couple of smaller crime drama/heist capers and two space epics, one with a bunch of DC Universe cameos. Though Big Picture is essentially Red Hood and the Outlaws resetting itself, the stories here are blithe and charming and offer a nice palate cleanser after the heaviness of the previous volume. James Tynion provides the book's first two issues. This is a curiously constructed trade; the first issue is the final chapter in Tynion's ten-part epic (the other nine parts of which are collected in Red Hood and the Outlaws Vol. 4: League of Assassins) and then second is an epilogue to Tynion's run. Had these issues been collected in Vol. 4, it would have made that a decent self-contained read; maybe eleven issues is prohibitively long, but I wish DC had gone that route. Instead, Vol. 4 necessarily needs Vol. 5 for its ending, even as the other stories here, while enjoyable, don't relate. That first issue reveals that Red Hood Jason Todd's seeming abandoning his friends and wiping his own memory was all a complicated plan to defeat Ra's al Ghul. That's clever on Tynion's part, and suggests that brass ring of "something Batman would do"; again, it's only unfortunate that the takeaway from Vol. 4 is that Jason is angst-ridden and petulant, and it's only in Vol. 5 that his self-assuredness is restored in the reader's mind. As well, as I said in my review of Vol. 4, Tynion clearly understands the heart of this series, as Jason defeats Ra's with a little help from (arcane simulacrums of) his friends. Tynion's second issue brings back Isabel, Jason's would-be girlfriend from Lobdell's run, and sets the Outlaws in the midst of a casino full of killer robots. It's a sweet and romantic issue, if you can believe Outlaws can be sweet and romantic, in which Isabel ultimately decides to return to her normal life and Jason embraces hunting billionaire supervillains with his friends. The issue is action-packed, funny, and the plot and character growth feed off one another; I wish more of Tynion's issues been like this instead of the long, convoluted League of Assassins story that enveloped most of his run. Will Pfeifer writes the final "regular" three-part arc of the book, "The Big Picture" (before Keatinge's two DC Universe Presents issues). "Picture" has going for it first of all that it's primarily an Arsenal story. As this series has proceeded, Lobdell's portrayal of Roy Harper as a goofy cut-up has faded (intentionally, I think) to reveal the weapons master we knew in earlier times. Here, a kidnapped Roy takes on three indestructible aliens on his own using mostly just his wits, as well as the story's surprise villain Lobo (mark one). Similarly, in the first of Keatinge's issues Roy saves himself from a mob boss and his pet monster through artful use of a quarter. Goof-off characters aren't interesting for very long, but goof-off characters hiding their skills behind bravado are, and I'm glad that Roy has grown in this series and in his relationships with Jason and Kori to the point that we can finally see some of the "old" Arsenal coming through. What "Picture" has going for it second is that aforementioned Lobo appearance, as well as Red Hood and Starfire versus Frankenstein, Agent of SHADE. That Frankenstein and Lobo appear in the same story should give the reader a sense of what a madcap romp "Big Picture" is, fantastically over the top. There's no good reason for Pfeifer to use Frankenstein other than he's just plain fun, and Frankenstein's inclusion raises my estimation of this book significantly. Lobo, the "Main Man" version, appears here as part of the unofficial crossover through a couple of books leading into Cullen Bunn's series; Pfeifer's Lobo plans a bit too much to be considered one and the same with his pre-Flashpoint counterpoint, but it's still fun to see the dreadlocked, cigar-chomping iteration, especially so unexpectedly. Big Picture wraps up, after Keatinge's DC Universe Presents Arsenal story, with another issue in that series spotlighting Starfire. Keatinge's one-shot is brilliant, establishing very quickly how Starfire returns to captivity and then challenging her "take no prisoners" approach to gaining her freedom. Keatinge writes Starfire like Marv Wolfman, an alien princess unfettered by human morality, and I think it's a shame this interesting portrayal seems to have been superseded in popular culture by her naive, winsome TV depiction. The only drawback to Keatinge's issue is that it ends with a tie back to his Arsenal story that's confusing, in the manner of cliffhangers, but that also seems unlikely to be explained with DC Universe Presents ended and no sense of this having been followed up in Red Hood. Interstitial trades like Red Hood and the Outlaws Vol. 5: The Big Picture can have a tendency to feel useless, simply marking time usually between one team and another. What redeems Big Picture is that it's fun, a word I've used a couple times here. Late in this series, Red Hood and the Outlaws has reached a point where the characters are still irreverent, but have enough history with one another that the book has authentic heart. If perhaps one had dropped this book when Scott Lobdell left the first time or never picked it up at all, Big Picture is a good primer on what there is to like about these characters before the new creative team (re-)takes over in the next volume. Is this book sell very well? With this many writers attached, it screams inconsistency and I could see readers staying away because of it. I understand what you're saying about the appearance of multiple writers, though in this case it's actually one writer finishing his run, one writer bridging the old and new/old teams, and then a writer of spotlight stories published in another book. So it's fairly innocent, so to speak, and also the stories by the three writers are all of good quality, though again I understand the appearance (see my next Red Hood review for more on how the optics hurt this book even as the stories are good).